A few years back, my breeding program switched from rebloomers in general to trying to produce summer rebloomers. 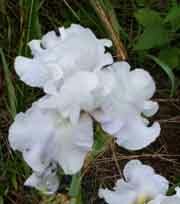 I'd gone to bed one night and sat straight up in the bed, thinking about irises that would bloom during the summer. I jumped out of bed and started the research, worked for a couple of hours before I got tired enough to go back to sleep. I guess I should emphasize the word "trying." This change in goals really slowed things down. One of my planned crosses, in 2011, was to use 2130-01Re, a summer rebloomer, as a pod parent with another summer rebloomer, 'Over and Over'. That cross was made but has not provided any rebloomers, yet. Since I had another stalk with blooms, I crossed it by 2025-02Re. 2025-01re, a sibling to 2025-02Re, is a summer bloomer, but, as is often the case, it wasn't blooming when I needed it. Several of the 2011 seedlings bloomed in the spring of 2015. All were a reddish purple, similar to the darker area in the falls of 2130-01Re, not really attractive. Only two seedlings looked different and one of those two rebloomed. This reblooming seedling, below, is 2611-01Re. It has perfect show bench branching, something I've been working toward for thirty years, and good form! Once branching is lost, it is hard to regain. Theoretically, most of the things I cross to this should have a very good chance of producing good branching. In theory, many of these should rebloom. So far, I've only seen the one. My goal is to have a line of irises that start their rebloom a bit earlier. This seedling does not open until mid September. Although I'll take whatever I can get, I don't expect to see this one bloom on September 1. It does look like we either have fall rebloomers or summer rebloomers. Only a handful will bloom from spring through fall. Many irises are easy to transplant at any time of year. Dig them up, divide, cart to new homes and tuck in. Clip off some leaves to reduce moisture loss while the new roots form, and away they go. Not so for PCIs. Treat them this way, and they go root tips up before you can find your watering can. Healthy PCI transplants: new fans, and healthy new white roots. Both of these I. douglasiana pieces are ready to plant. There are two times of year to successfully transplant PCIs: Autumn and Spring. At these times, PCI roots are in active growth. 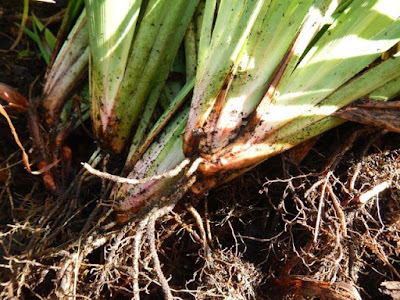 Check the roots, removing soil gently around the base of a fan or two. 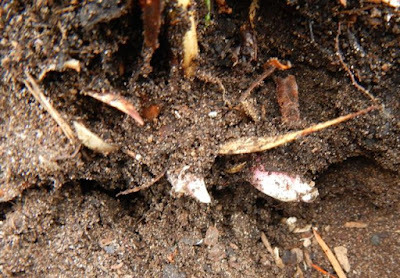 If there are white roots, one to four inches long, then get out the shovel and start digging. It's time. New fans on a PCI, but no new roots yet; this plant needs to wait a few weeks before being divided. 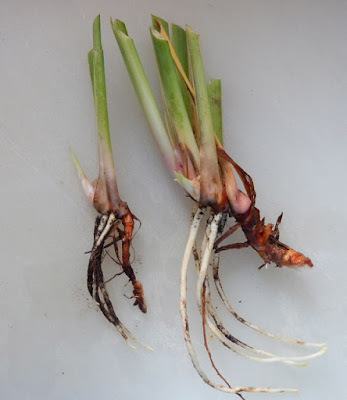 Why Autumn and Spring for root growth? Pacifica Iris are native to the West Coast of North America, which has a Mediterranean climate––during the drought period each summer, these and other native species go dormant. In mild winter climates, PCI may have live roots all winter, but they dry down and wait out dry summers. Summer drought duration depends on latitude, the farther south you are, the longer the duration, which varies from less than three months to more than ten months on the West Coast. I garden at 46°N, so droughts usually last less than three months, though this year it was more than five. If you water regularly, PCI initiate new roots earlier in the fall than do those depending on rain. You can divide and transplant much earlier in the fall and later in the spring. This flat of PCI seedlings has been watered regularly all summer, and is ready to move into the garden. PCI seedlings in pots are tough, and can stand being transplanted several times in the first year or two of life. Even larger plants, one to five gallons, can withstand transplanting slightly outside the Autumn or Spring periods. These have all had regular water, as they must to live in pots. Every Autumn I host a 'Come and Dig PCI' day in my garden, to share out plants to other gardens in my community. I checked my plants this week; new fans are starting to form, and new roots are short. I'll wait a week or two, until new roots are more than an inch long. There are exceptions; one variety has long white roots and could be divided now, but it will tolerate moving in a few weeks. The seedling PCI can be planted anytime from now until early November. They are much tougher than fan sections, which is why growing PCI from seed is so successful for many gardeners. 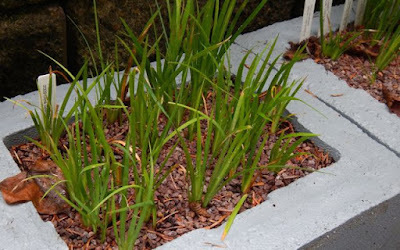 Society for Pacific Coast Native Iris will hold its seed exchange from 1 November to the end of the year, so now is the time to be thinking about what species and hybrids you'd like to grow in your garden from seed. New white roots, this PCI is ready for a new home. 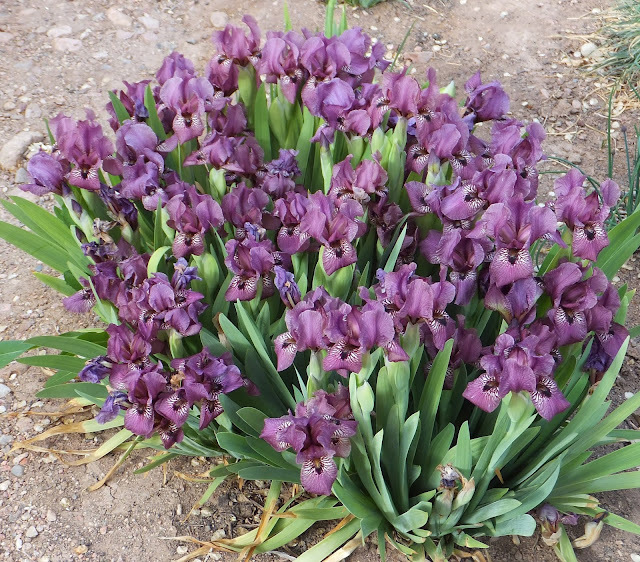 For western gardeners, Autumn is the best time to plant many native plants, not just Pacifica Iris. Trees, shrubs, perennials, ferns and grasses all do well if planted now (late September to early November), as the weather cools and moisture arrives from the Pacific Ocean over western North America. This gives the plants a jump on growth for the coming year by establishing good root systems first, with much less water use now and in coming years. We iris lovers take for granted the huge amount of information that is available online, and because there are so many people sharing their love for iris with photographs, blogs, and plainly just posts on Facebook, we forget that there are those in the iris community that are really experts in the field. I didn’t know anything about Kevin Vaughn just a few months ago, and didn’t think of him as an expert when I first met him. In fact I thought of him as another iris fan with an amazing taste for garden design, but after reading all the details in his book I realized that the love for irises runs deeply than that for him. Today I believe that he has not only great advice to give on how to grow irises successfully, but also offers a multitude of information that makes reading his new book a joy. During the recent National Convention of The American Iris Society, held in Portland, Oregon, attendees were able to experience the beauty of Kevin Vaughn’s garden twice. Once during the pre-convention (optional) tour, and then as part of the Siberian & Species Convention held after the regular convention. It was during these two sessions that I had the pleasure to meet Kevin Vaughn and enjoy his friendly demeanor, and also his knowledge of irises. One feature of the Portland convention that was really different from other conventions is that many of the irises were blooming at the same time. Call it "Global Warming," or simply, "the weather." Normally, one would not see this, but having all the different irises blooming at the same time made it an extraordinary experience. 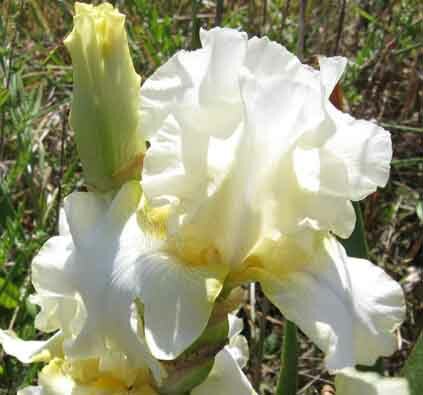 The Vaughn garden had a huge variety of iris types, Louisiana, Spuria, Siberian, median and other irises, several of which he's also hybridizing. There was a particular combination towards the back of the property that really caught my attention: a fantastic display with a gorgeous bright yellow i. pseudacorus next to a deep purple Siberian iris seedling. Both reaching five feet tall and blooming in full glory. What a sight! (I'm still to post the many photos of this garden, stay tuned). Even though Kevin grows many bearded and non-bearded irises, this book focuses on everything that is fascinating about the latter. With this gorgeous book, suddenly a wide variety of non-bearded iris types are introduced in a way that is easy to understand, with a multitude of photographs to tempt the unsuspecting reader to take a chance; perhaps grow a few of them. "What is the purpose of the beard on bearded irises, and how do beardless irises do without them?" If you don't grow beardless irises in your garden at this time, after reading this book you may just start doing so. Some of the sections on each chapter such as, "Garden Use and Culture," Pests and Diseases," and Kevin's own "Favorites," will help you make decisions about where to start. I hope you also start keeping an eye on Kevin Vaughn's work as I have, as many of the iris seedlings in his garden show much promise. 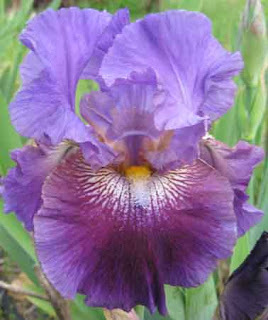 I have started to add some of his Spuria irises to my wish list, and one of the first ones is a child of 'Adriatic Blue' called 'Adriatic Memories,' that is just amazing. Can't wait to see it growing in my own little garden. Plicatas: irises that have stippled, dotted or stitched edges around the rim and possibly also the standards on a ground color of white, yellow, apricot, or pink. (Stippling, in drawing, painting, and engraving, is to mark a surface with numerous small dots or specks.) The ground color on the standards and falls doesn't have to be the same. There can be dotting, peppering, or striping covering the falls and standards. Hybridizers are working on creating plicatas with more intense depth of color, such as orange, for the background. This is 'Drama Queen' (Keppel,2002) with artistic effects that really dramatize the lines and stippling of this stunning iris. For this post, I have put together a continuation of my last theme on how to use photos to extend the iris season. 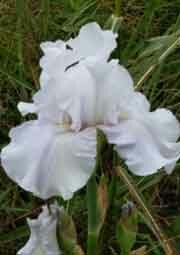 The last post described using different media to enjoy irises. This slideshow is on plicatas, and also uses Smilebox (you do not have to have it downloaded on your computer to view the show). The slideshow has 49 pictures, counting the collages at the end, lasts seven minutes, and has musical accompaniment, so adjust the volume on your speakers. While the slideshow is loading click on the button to make the show full screen. It looks like this except yours won't be yellow. I hope all of you have at least a few plicatas. They add interest to the garden. If you grow plicatas, post in the comment section below which are your favorites. I would love to hear from you.